James B. Martino serves as a member of the Second Quorum of the Seventy of The Church of Jesus Christ of Latter-day Saints. He had been serving as a member of the Sixth Quorum of the Seventy at the time of his call. Martino received his bachelor’s degree in business from Brigham Young University then set aside graduate school when his father asked him to work for Russell-Newman, a family apparel company. He was president and CEO from 1989 to 2000 and chairman from 2003 to 2009. 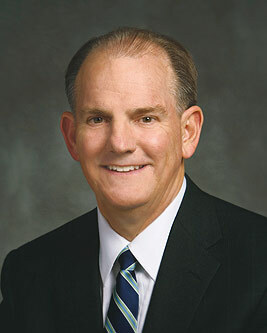 He was sustained a general authority on April 4, 2009. He was born on March 28, 1951, in Denton, Texas. He and his parents and brothers joined the Church in 1968. Two years later he served as a full-time missionary in the Guatemala-El Salvador Mission. His girlfriend, Marie, investigated the Church while he served, and he was able to baptize her soon after he concluded his mission. They married and are the parents of five children. He later served as seminary teacher, stake executive secretary, bishop, stake president, high councilor, and mission president’s counselor. He presided over the Venezuela Maracaibo Mission from 2000 to 2003. This page was last edited on 30 November 2015, at 14:53.